Our range of express delivery and same day courier services will deliver your goods 24/7 wherever you need them, quickly and safely. When you have a deadline or there’s a lot riding on getting something delivered fast. The express delivery courier service will save the day. If it ﬁts in a courier van or on a 1 tonne ute, we’ll pick up the goods from your location for fast express courier delivery to any destination in the metro area. When you just need to ensure it gets delivered today. Our cost-effective same day courier service keeps your boss and your client happy. Whether it’s important documents or stock for a customer, the same day courier service is ﬂexible, efﬁcient and reliable. means that you are the top priority for us and everything else comes second. direct to the destination. If it’s country or interstate, we arrange for your goods to be on the next available vehicle. When you need swift delivery of documents or parcels within the Adelaide CBD. Our nimble bike courier team are at the ready. 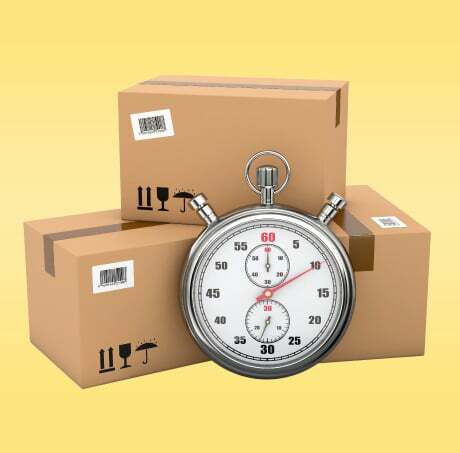 Pick-up and delivery within 15 minutes of booking for top priority express delivery. Pick-up and delivery within 30 minutes of booking. Pick-up and delivery within 60 minutes of booking. Whether it’s an important document that needs to get to the other side of the city or an urgent stock delivery for a customer, our express couriers will get your goods delivered quickly and safely. To book a same day courier or express delivery, call us now on 131 770 or use our online booking system. For more info on any of our same day courier or express delivery service, either call us on 131 770 or fill out our enquiry form below and we’ll get back to you quickly.